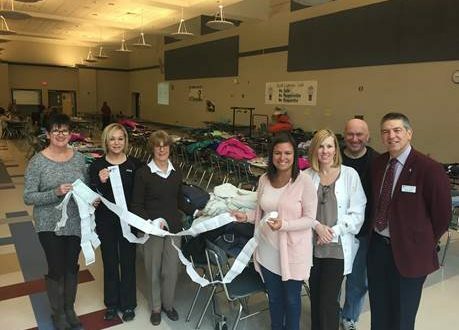 School nursing staff of the New Bedford Educators Association collected more than $3,900 in donations for their annual winter coat drive. With the donations, the staff were able to purchase more than $5,000 worth of clothing and toiletries for students in need with discounts from local businesses. Funds were used to purchase not only coats, but socks, underwear, toiletries and other items for students in need. Packages of items were also organized by school nurses for their students. Interim Supervisor of School Nurses Wanda Nunes said that the donations are for students of all grade levels and across all schools in New Bedford. Several members of the nursing staff from across the district participated in shopping for warm winter clothing and items in need for students. Peter Muise, President & CEO of First Citizens’ Federal Credit Union, which was a major sponsor of the drive and included donation boxes in their New Bedford branches, said the credit union is proud to be a part of the coat drive. NBEA received contributions from First Citizens’ Federal Credit Union, the Friendly Sons of St. Patrick, and School Committee member Bruce J. Oliveira. Anyone interested in supporting the Winter Coat Drive may contact Lou St. John, NBEA President, at nbeducators@yahoo.com or 508-984-4441.